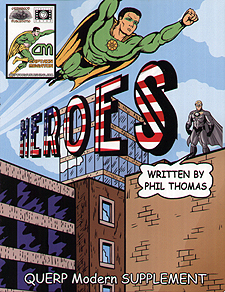 The world is in peril and only you and your fellow Superheroes can save the day! Welcome to QUERP Heroes. Welcome to a world much like your own, where people live out their daily lives, caring for family, going to work and partying with friends. Welcome to a world where crime, war, failing ecomonies and widespread famine influence the lives of millions every day. What is the main difference between this worlde and yours? QUERP Heroes Allows you to become one of a rare group of individuals from across the globe that have been gifted with rare and fantastic capabilities; superpowers. Together, you and your super-powered friends will become heroes straight out of the comic books, busting heads, taking names, fighting crime and tracking down evil wherever it lurks. Along the way you will face petty street thugs, giant monsters, supernatural beasts, mighty villains and evil masterminds, growing in strength, reputation and power and earning that title of Superhero. This is not a stand-alone product and requires the QUERP Modern core rule book to play.